Milos Raonic returns a shot from Thiemo De Bakker of the Netherlands, in Davis Cup tennis action in Toronto, Sept. 14, 2018. Milos Raonic hadn’t played in the Davis Cup since 2015, and it had not been easy to say no to Team Canada all those times. But it felt sweet to be back playing in Canadian colours on Friday night in Toronto, launching his team’s efforts against the Netherlands with a straight-sets win. Raonic fired 23 aces and beat world No. 236 Thiemo de Bakker 6-3, 6-2, 6-2 as Canada opened its tie with the Dutch in a unique indoor setting in downtown Toronto. Yet 19-year-old Torontonian Denis Shapovalov had the far tougher opponent on Friday night, and provided the late-evening fireworks. Team Canada’s World No.34 roared back after losing the first two sets and pulled off an incredible win over the Dutch team’s top singles player, World No. 43 Robin Haase 3-6, 3-6, 7-5, 6-3, 6-4. As his team whooped and celebrated, they pulled ahead in the tie 2-0 going into Saturday’s doubles matches. The event took place inside newly named Coca-Cola Coliseum at Exhibition Place, formerly Ricoh Coliseum, the home of the AHL’s Toronto Marlies. Quite a contrast to the outdoor York University setting of the Rogers Cup. Growing up, Raonic used to go to downtown Toronto from his home in the northern suburbs to watch many pro events. So the 27-year-old world No. 20 – Canada’s top-ranked singles player of the moment – was savouring the rare opportunity to play tennis in the heart of his city. Raonic’s last time in a Davis Cup tie had been in Vancouver in 2015, when Canada beat Japan. Team Canada had won 10 of the 11 ties in which he had played going into this weekend. Injuries to his 6-foot-5 frame have sometimes caused him to decline invitations or travel requirements were too challenging for his schedule. Sometimes the spontaneous change of surface for the tie would disrupt his training, or he simply needed a much-needed training block or recovery period. As at any Canadian Davis Cup tie, there were banging drums on Friday against a backdrop of red wigs, T-shirts, hockey sweaters and Canadian flags draped over shoulders. There were small pocket of fans in orange suits and hats too, waving Dutch flags. There were lots of seats curtained off inside the venue that holds 6,500 for tennis, with the court shifted to one end of where the ice surface would usually be. 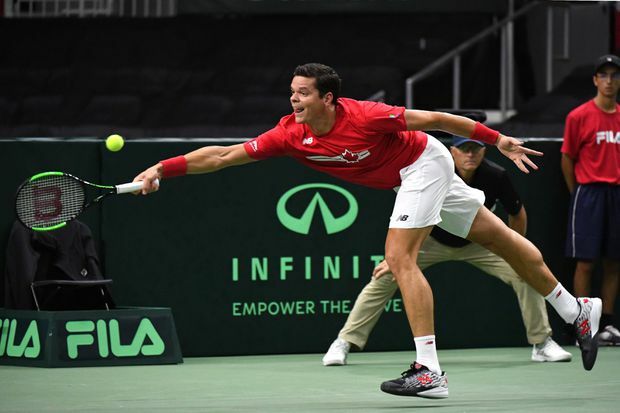 Raonic was decked in a red Team Canada T-shirt, white shorts and a patriotic-looking pair of New Balance sneakers, rolling to an easy best-three-out-of-five sets win that took just 1 hour 42 minutes. Raonic overcame an early break by de Bakker and recovered from some lazy points. The Dutch player leaned heavily on his drop shot to try stumping the tall Canadian at the net in the second set. It worked early on, but Raonic seemed to improve his mobility and kept perplexing the Dutch player with blistering serves of more than 230 km/h.